Frog Love Candy - cut rope: The adventure is the sequel that follows the adventures of Robin Bobbin, a constantly hungry guy who likes to eat sweets. Follow him and his friends on this amazing journey with the addition of dozens of new levels. The journey will take you to different places from the countryside and big cities into the jungle and snowy mountains - all in pursuit of one task: there are sweets! Easy to navigate, but harder to master, Crop cord: Adventure. like both preschool and adults! It has a fast-paced gameplay with a carefully selected soundtrack to create an experience like no other. Each new level has increasing difficulties, and you will need to learn how to anticipate what obstacles will follow, and be able to respond to all the twists and turns. If you liked Frog Love Candy - cut rope: Adventure, you will definitely fall in love with Frog Love Candy - cut rope: Adventure! NEW CARDS FOR EXCEPTION! Experience 99 completely new levels. NEW CHARACTERS MEET! Find 10 new characters accompanying Robin Bobbin on the road. NEW TYPES OF CANDIDENTS FOR TASTE! NEW GRAPHICS, SOUND AND ELEMENTS OF THE GAME. So, what are you waiting for? Come on! 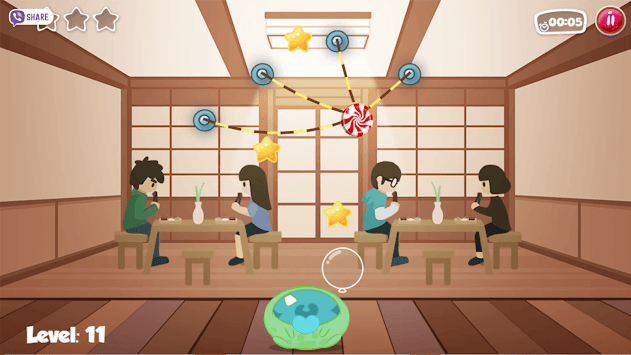 Check your reflexes and go on a trip with Robin Bobbin and his friends. See the surprises and miracles that each level holds for you.